I’m mad. Its a good kind of mad however that made me start writing this blog. 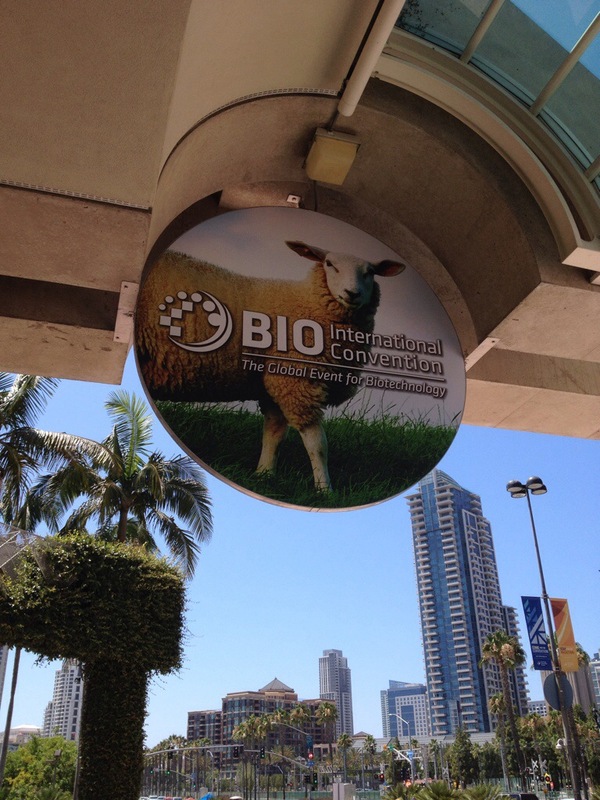 After attending several hours of panel discussions ranging from a variety of topics from bioethics to rising leaders, then followed by a nice stroll through the international exhibition, I’m left amazed. The things being done with biotech is really revolutionary indeed. Having seen and met with scientists and other experts, I’m filled with so much inspiration and promise of how Hawaii could become a key figure in all of this if we nurture it. It also gives me hope of the unique opportunities that this field may offer my two kids in the future if we make this field a priority here. But is Hawaii’s leadership moving us in the right direction? Unfortunately, it’s not happening in out state. From the time I say and spoke to those dozen legislators in January, who told me that the farmers need to do more to educate the public, it’s clear that only a few leaders have the backbone to move Hawaii forward by standing up the technology that is revolutionizing agriculture, forestry, environmental issues, medicine, and energy. That minority of leaders who stood there publicly to support the right to farm act had to take the horrid behavior of angry mob mentality, which is truly disheartening to me. While states like California and countries across the world are booming with opportunity and research, Hawaii’s weak leadership continue to fail us all. From Jessica Wooley, Mike Gabbard, Brian Schatz, Kaniela Ing, Russell Ruderman, Gary Hooser, Tulsi Gabbard, David Ige, and so many others, they use poor leadership to guide Hawaii in fear while the rest of the world is embracing and supporting biotechnology. It’s terrible that leaders like these are fueling serious harm for my kids’ future. 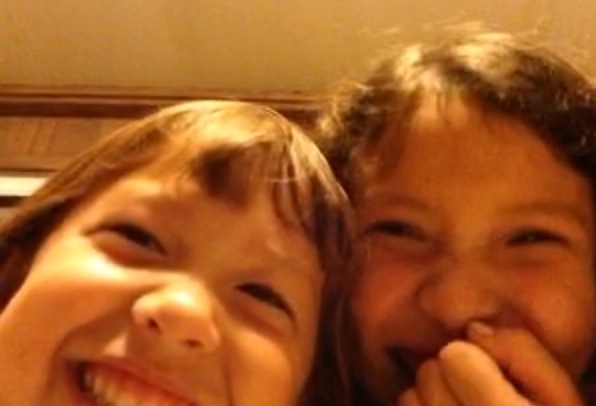 I’d truly love a Hawaii where my kids would have diverse opportunities to be a global contributor. Being that global citizen does not come with raising kids up to attend anti-GMO marches and seed exchanges to “revolutionize” the food system. Nor does it come in the form of beach clean up efforts by groups that claim false information against a technology they know nothing about. I was taught as a kid to always think about how I was going to do something to help others, which is rooted in education and instilling a sense of curiosity about the world. I want a future Hawaii that values education on a worldwide scale. We are island people but it doesn’t mean we should think of ourselves like that. We can affect our world in so many ways that are unforeseeable if our leaders are willing to guide us in that way. I’m so grateful for having the opportunity to attend this conference as it has really opened my eyes. I have a greater vision for the future that I want to nurture for my kids, and I hope others start realizing this too. If we don’t move in the right way, we’ve truly shown the world that we do not want to be global citizens, and I refuse to be led down that path by others. As a mom who can see the potential for a better Hawaii, I will continue to fight for the Hawaii I want for my kids. It’s my duty as a parent first and foremost to them. I remember back 15 years ago when I was deciding on what school I wanted to attend for my final step in becoming an occupational therapist. I applied at several West coast schools and Washington University in St. Louis. As I sat with my parents discussing my choices, it was clear which school my dad wanted me to go to. He wanted me to go to Wash U. 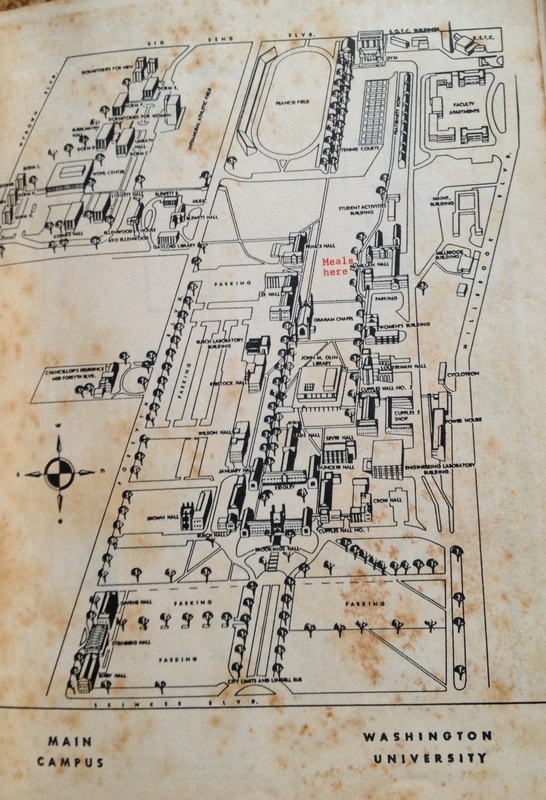 Why Washington University in St. Louis? As a young and upcoming leader, he had an opportunity to attend the Danforth Fellowship sponsored by Ralston Purina. He had attended a land grant college and was invited to attend this event that would open the eyes to people going into agriculture. 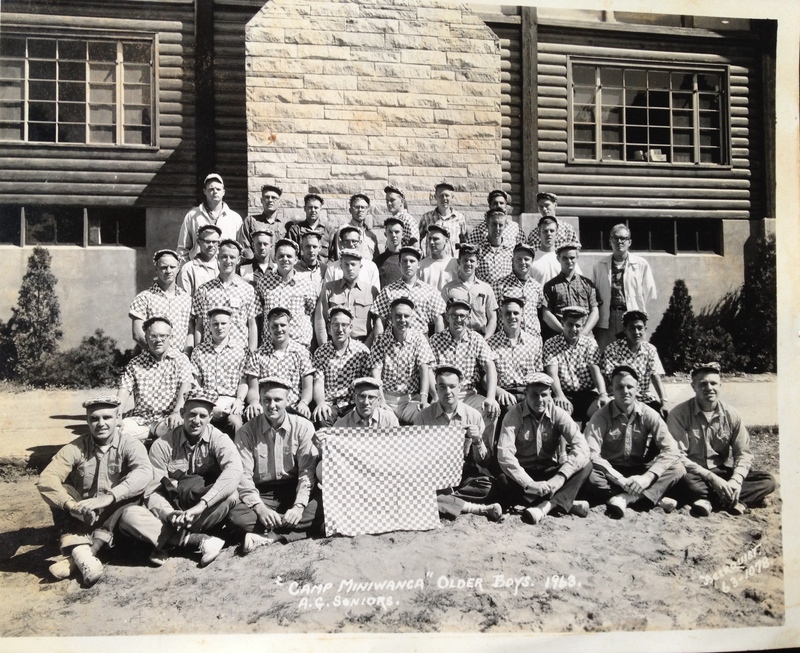 Part of this fellowship was spent to he Wash U campus where he had the chance to see the latest and greatest research in agriculture, medicine, and engineering. It was pretty amazing things to see for a Hawaii boy indeed. So when I told him that I really was considering going to Wash U, he got super excited and said to go there. He knew that what I’d see and learn there would definitely open up my eyes and mind. And like all dad’s advice, he was right about it. The OT school itself was an amazing place to be. There were the latest and greatest gadgets being used to help people with disabilities, state of the art home modifications, research on how to facilitate independence with self care, and innovative programs to take care of those with mental health issues and children with special needs. Even though I had volunteered at the state of the art acute rehab hospital in Hawaii for nearly 3 years, what I saw there just blew me away. There were great things happening and I had barely scratched the surface. I was excited to learn more. Now that it has been nearly 15 years since I left Wash U, I realize how much that two years there really changed me as a person. There are so many amazing things happening in research around the world to make life better for people. School itself gave me the facts and theory base to practice OT but it did so much more than that. It gave me a way to think about things in a whole different perspective. I learned a very unique way of thinking that was never taught to me… Systems thinking. In grade school and even through college, I was taught to think very linearly. If you do X, then Y will result. The problem with that kind of thought process is that the world does not operate linearly. Everything is tied together and interdependent on each other. Affecting one part to change another always results in unintended consequences if we don’t thoroughly look at the entire system that we are affecting. It’s a pretty big way of thinking and leads to more questions that answers, but that is the beauty of it. We can really start to see the bigger issues and start to realize those consequences more thoroughly before jumping to some grandiose solution. I feel as if it makes my mind start exploding with ideas and integrating of the all the connections. It’s fun and frustrating to think of the issues in this way but so very helpful. My mind is always thinking about things and connecting the dots to how everything is integrated as part of this system. 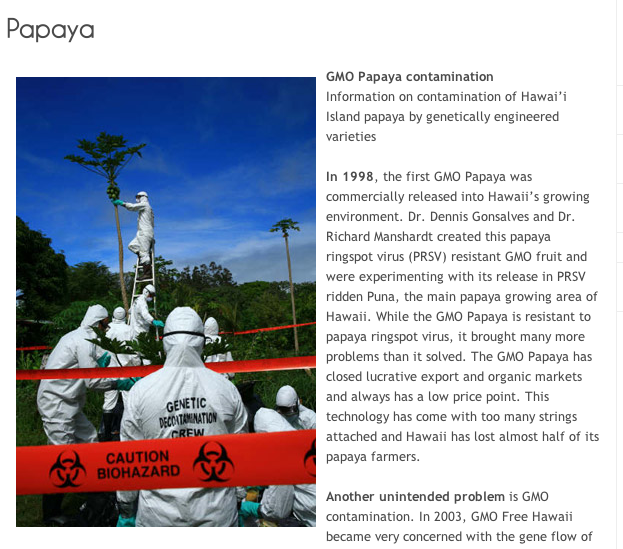 Too many people have become very small thinkers here in Hawaii as we can see with the whole anti-GMO “non-controversy.” It will never matter what kind of tests or evidence comes up, the narrative against the technology is all about the “multinational agribusiness companies.” Little do people realize the impact biotechnology is having around the work and in their own lives! From food to medicine to textiles, we are surrounded by biotechnology but the majority continues to fear it. I can never expect everyone to see the world as I do or think like myself because my experiences are unique. I wish others think further and research their facts and statements before becoming grounded in ideology. The very ideology that leads them into thinking they are saving the world does the complete opposite and they don’t even realize it. Most of the anti-GMO club members have never suffered a day in their life. None has ever starved a day in their life or had to grow all of their food and textiles. No Moms on a Mission members have lost a child due to starvation or preventable blindness caused by a lack of nutrition. None of the Babes Against Biotech has spend more than a day trying to grow food for the masses and dealing with the bugs and pests. None of the rich part time millionaires funding these activists have farmed a day in their life or contributed those carrots that they claim will help poor children. 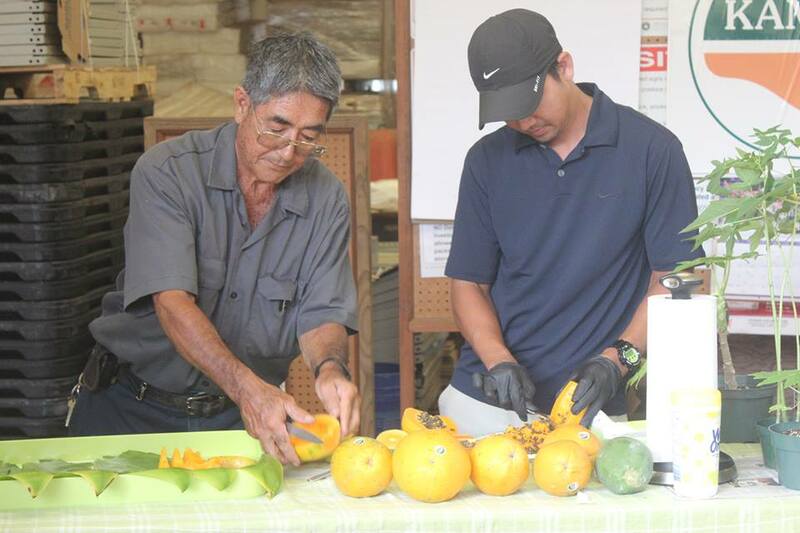 None of the proponents of the Hawaii Organic Farming Association has ever lost thousands of dollars worth of crops to disease and crop destruction or had people tell them that their fruit was poisonous. I highly doubt that politicians like Kaniela Ing, Gary Hooser, Tim Bynum, Elle Cochran, Margaret Wille, Brenda Ford, or Russell Ruderman have had to figure out how to stretch their dollar to the end of the month to feed their families. These people live in a completely different world than most people I know. They have plenty of food available but will easily complain that they don’t have a disingenuous “right to know,” when in reality, they can simply choose organic. They are willing to push for political favoring for this kind of movement, ignoring the costs and implications it will have on everything else. From having to enact the law and enforcing it in the name of curiosity, they are willing to have everyone pay for this. These people talk about wanting more locally grown food but then turn around and push for laws that make it even harder to farm by limiting tools and technology available. They also have no qualms with spreading fear and misinformation against certain farmers and don’t think twice about it. There in no integrity among the followers of this GMO free movement at all. They thrive solely on fear, emotion, and plain old ignorance of how these decisions will have so many unintended consequences. That’s just irresponsible and not how we need to move forward for a better future. Do we want a world steeped in fear, misinformation, and lies of a technology being perpetuated by mob like mentality? Or do we want an open future that has a huge potential to impact our own lives as well as the lives of other in the world? We all live together in this world and we should move forward using facts, evidence, and knowledge. That’s the world I want for my children. 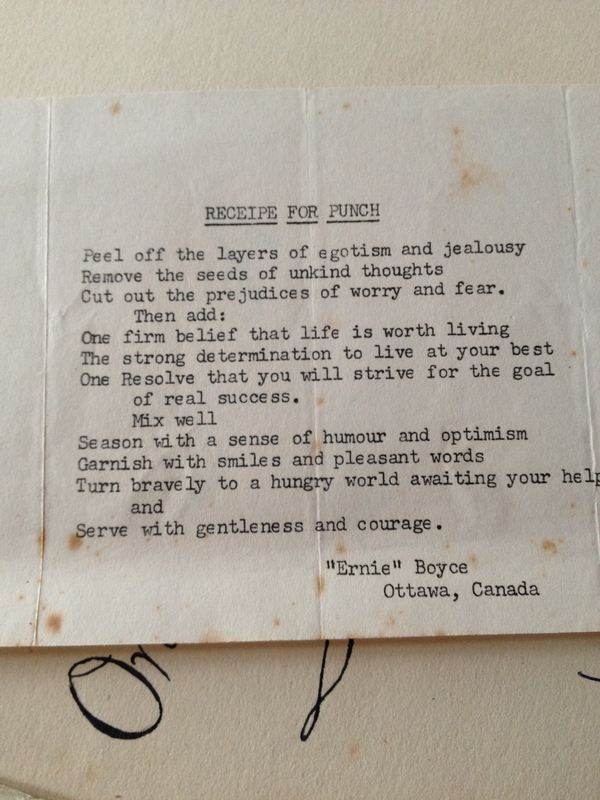 A poem saved by my dad that still inspires him to this day. My thoughts on the whole biotech issue here in Hawaii… When you’re a doctor, your authority is respected. You can decide the treatment for your patients and the kind of medicines that you will prescribe. When you’re a dentist, you are also allowed to decide your plan of care for that resident. These professionals have gone to school and training to get the expertise that they do to work in their respected fields. They hold the expertise to do what they do. The general public and politicians are not allowed to dictate to these professionals what their clinical decisions will be. It is just not in their scope or expertise to take up such roles and is unethical for them to decide that. Given that, why the heck are we allowing the general public and politicians to be given full authority to decide for farmers what they can and can’t do? Many farmers have been working in their professions for decades and have degrees to back it up. The professionals that support them also have a lot of training and expertise to help farmers. They know the science and base knowledge to help get things grown. Their authority is being questioned by a public informed via internet memes and conspiracy theories. All the meanwhile, the public and politicians are allowed to point finger and dictate what you can and can’t do, yet they have NO experience or expertise in agriculture but get the louder voice. They use the claim that they are the customer which gives them the right. If you’re the patient telling your doctor how you want to be treated because it’s your right, I bet most doctors will say go find yourself another one. They won’t take that, and nor will a farmer. Go find your food from another farmer which is you’re right but don’t tell all farmers what they can and can’t do! What this whole issue really boils down to is that it’s not the “customers” telling farmers how to do things, it’s an industry. Yes, it’s that big industry that are funding these campaigns to tell people and politicians what farmers need to do. It’s the organic industry that’s behind this disingenuous “right to know” campaign and marches across the world. Essentially, the small farmers like my dad are being told by the likes of organic activists from the Hawaii Center for Food Safety, Ashley Lukens and her boss Andrew Kimbrell, Ronnie Cummins, NYT writer Michael Pollan, former Representative Jessica Wooley, Representative Tulsi Gabbard, and the bikini clad Naomi Carmona, that they have to listen to their demands. None of them are farmers or have any training to make the claims they do or know what it’s like to be subject to the uncontrollable elements of the job. These people suddenly can point fingers and tell you what you can and can’t use and how you’re going to have YOUR product labeled as it’s your call. I just can’t sit back and be quiet about what’s happening to farmers like my dad and brother. They are the professionals who should be respected and heard, not the activists who are loud, rude and obnoxious. We rely on the farmer’s knowledge and expertise to get our food and it’s not the opposite. If we’re not the ones growing it, we’d better learn from those who do grow it instead of listening to what a dishonest industry is funding people to say and do. The organic industry is the Goliath that my dad and brother are up against. It’s a war only to be won on facts and truth, something that the organic industry is incapable of embodying. If You Want to be Governor Mr. Ige, Please Do Your Homework! When I opened up the local section of the paper this past Sunday, a small headline in the local section caught my eye. 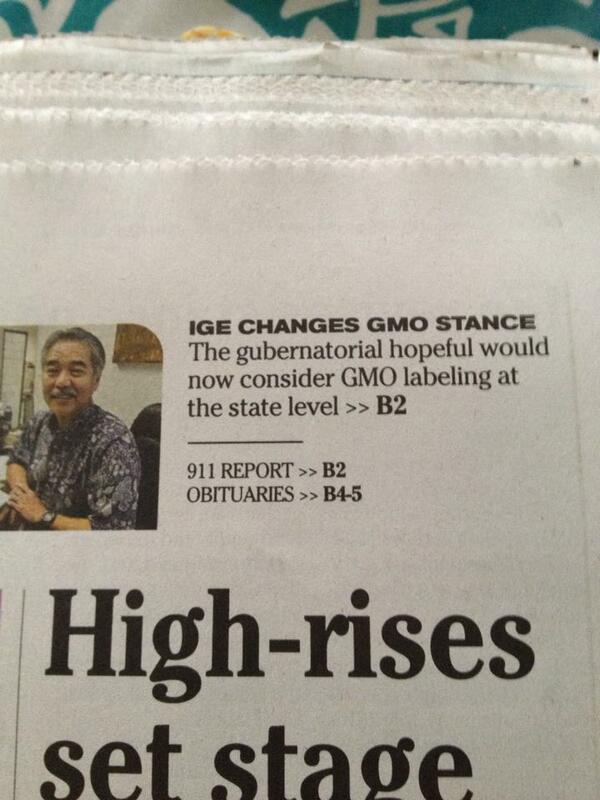 The gubernatorial candidate, David Ige, decided to consider GMO labeling at the state level. For a candidate who is saying he wants to make Hawaii a better place, this is really a kick in the face. Once again, this is just proof that politicians do not do their homework when it comes down to the unintended consequences of stances such as these. Is it really the “right to know” or something else? The article proceeds to explain that he now believes in the disingenuous “right to know” campaign. He apparently has not looked in the sources behind the scenes of who is saying what. These organic industry people make this claim but then behind the scenes say this about biotechnology. I suspect that Mr. Ige and other candidates don’t have much knowledge into this industry either when they simply fall for this line. The National Organic Program was founded by an Act of Congress in 2000 to help sell products at a premium. This program is not about nutrition or food safety or food affordability. It also falls under the USDA Agricultural Marketing Service and not under any health or environmental programs. This is really an industry asking for a label and not a right to know. Basically, if you follow the rules stated, you can obtain certification to help sell your products at higher prices. It is not about being pesticide free either as there is a list of chemicals approved for usage in production that is synthetic in many cases. The industry tries to market it as being pesticide free and more healthful for you but the reality is that there is little evidence to support it. This is about the organic industry demanding that farmers label their product and not about a right to know. Who’s funding the whole movement? It’s organic activists from the Center for Food Safety to quacks like Jeffrey M. Smith and his movies that scare people from this technology. It’s a big industry going after the small farmers that grow biotech here from Belmes Farms to my dad’s farms in an attempt to get the big ag companies. Most people that I talk to don’t read much for the science and agriculture world. Many are completely unaware of the issues that are affecting the growing of crops in our state and beyond. From a devastating banana fungus decimating crops in Central America and drought hitting parts of Africa where they can’t grow things, or a deadly disease leaving cassava crops inedible and toxic, the world’s food security is at risk with climate change. We are so well fed and nourished that this tough never crosses our minds. It’s a real threat to others as billions of people go to bed hungry every night. If Hawaii has the capability to alleviate some of the world’s suffering, why block it with fear and misinformation of a very powerful tool? The fights going on in the labeling arena tells the rest of the world that there is something wrong with this product that it needs to be segregated. Think about what a label can do. Follow the stories of groundbreaking research with the glowing pigs and glowing rabbits here at the University of Hawaii. The commentary under much of these stories on the news is disheartening at best. People are afraid of this technology that can have a huge impact on people’s quality of lives. To jump on the labeling issue on fuels more of the ignorance of this technology that should be embraced and not feared the way it is now. Do we want leaders to lead us into darkness or to knowledge? Supporting the farmers we have now! I heard an interesting statistic the other day that really opened my eyes. Back in the 1850’s, there were 23 million people living in the US with 74% of the population involved in agriculture. Fast forward ahead to 2012 and we have 313 million people with only 1.5% involved in farming now. That 1.5% has got to be ultra efficient in delivering food to the masses which is indeed happened. No longer are the majority of us having to grow our own food. We have become freer to do other things with our lives which is a great thing! The technology has changed tremendously and farmers can choose the tools they want to achieve this goal. It makes me mad when a politician, another disconnected person from agriculture, can sit up on his pulpit and point fingers as to what a farmer needs to do. Does the politician ever ask a farmer how his decision will affect him? It seems like never and that is the wrong path to take. Does anti-biotech, pro-labeling politicians ever faced the misinformation campaigns that this 1.5%? Never. Meanwhile, this is what papaya farmers get to face. If you truly want local food grown by local farmers, I think it best that you stay away from people who are attempting to attempting to smear them with fear and misinformation. The evidence clearly shows that biotech foods are safe and many world science organizations have also taken that same stance. Spending time satisfying the desires of the activists isn’t going to be helping Hawaii reach our goals for food security and sustainability. They will only keep going after more issues with agriculture to make it even harder to farm. Most of all, a real leader will never stand to support the people who do and say this about my dad and others in agriculture. So those same people who are demanding that right to know are saying this publicly about our farmers and this doesn’t sit well with me. 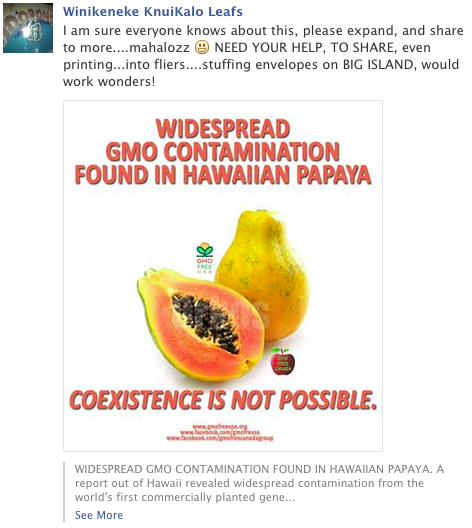 If it really is the right to know, why are they all apart of these GMO Free groups across of our islands? 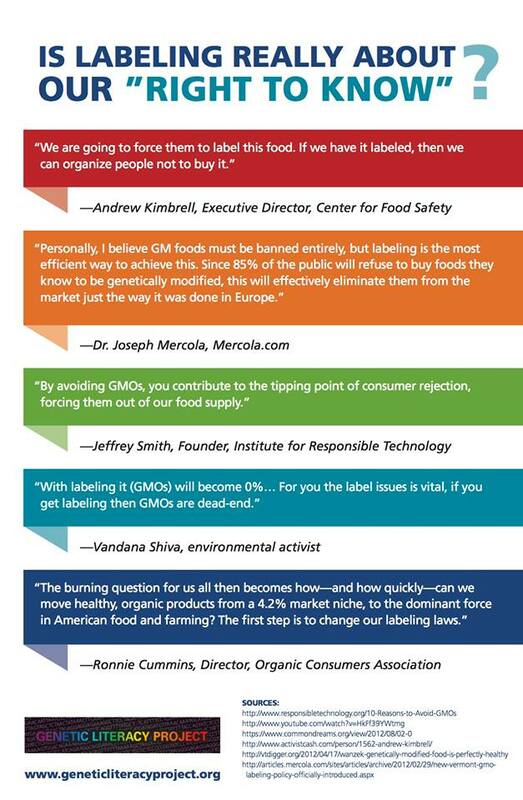 GMO free and wanting a label and disclosure is so insincere and they know it. Fighting for the rubbah slippah folks! Not sure if you saw the recent Forbes post that Hawaii is the worst place to make a living. I am starting to feel that it is true. Everything from milk to gasoline is going up but our paychecks aren’t matching these increases. Trying to burden people with GMO labeling to support activists’ demands isn’t going to make things any better for affordability. This labeling indeed comes with a cost that will definitely make food less affordable for us that you can’t even imagine, which is why trying to do this at the Federal level if indicated, is a better option. Either way, there will be an increase in costs that will hurt everyone, especially those on limited incomes. 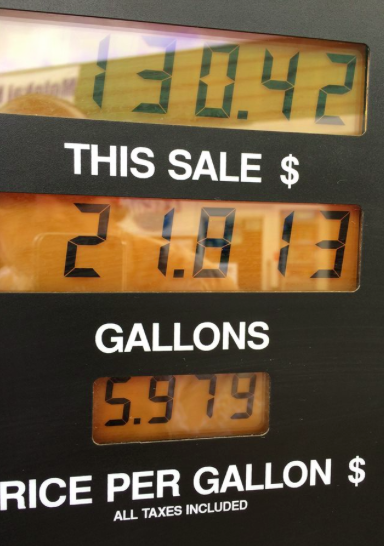 The price of gas in Molokai. Let’s just say, unaffordable! A real leader of the people will do things to help all in society, not just a few to burden the majority. What does the data say? Is this something really necessary? Who will be impacted the most by this? Instead of talking about your stances, ask questions first. Too many times politicians are talking heads with poor insight on the unintended consequences of their decisions. 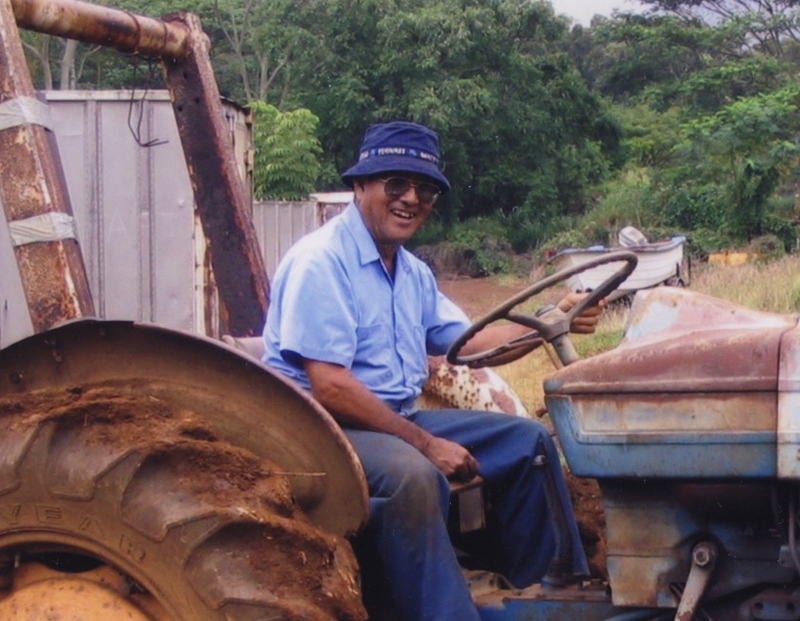 Well, I’ve got to be somewhat forgiving as people like Mr. Ige and bandwagon jumpers like Representative Kaniela Ing aren’t farmers or even bother to know them. They work in clean air conditioned offices and are completely disconnected from the work of people like my dad and brother. They don’t understand at all what it really takes to get food to a table and the work involved. I’ll just leave a reminder here of who they are attacking when they align with activists demands… It’s my family and other families that do the same work as us! 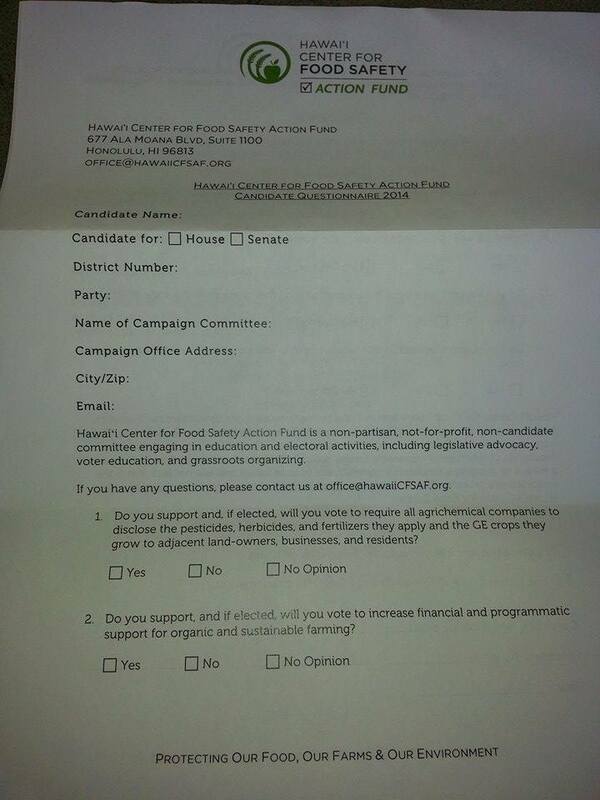 There’s a new super political action committee in town and they are out to influence local politics here. The Washington, D.C. based Center for Food Safety set up office here and is raising money to change Hawaii to their liking. This is actually a neo-luddite group that is disguised as a benign sounding consumer group which it is not. They are really an activist group run by organic industry leaders and activists. They are not about helping with food security and food safety in Hawaii or supporting agriculture in our islands unless it is their way. Let’s take apart some of the questions that they are posing to see what this innocuous sounding group is really after. 1) Do you support, and if elected, will you vote to require all agrichemical companies to disclose pesticides, herbicides, and fertilizers that apply and GE crops they grow to adjacent landowners , businesses, and residents? Basically, they want to apply the same anti-GMO ordinance that they enacted on Kauai to the whole state. 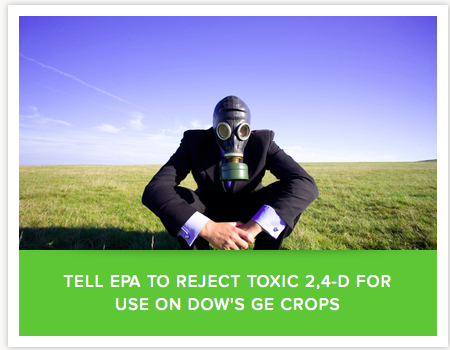 It is discriminating against a safe and approved crop as regulated by the Federal government. Once again, they are seeking to divide and conquer agriculture in our islands by creating this divide again. There already was a pesticide registry passed at the state level last year by a CFS favorite, Jessica Wooley. Who is to say that they are not going to try to have all farmers covered by this law if they use pesticides? How many burdens do we want to put on others for the sake of attacking the bigger industries here? 2) Do you support, and if elected, will you vote to increase financial and programmatic support for organic and sustainable farming? First of all, the CFS is implying once again that only organic is sustainable. The fail to mention to the candidate who does not do research that this “organic” issue is really a lobby created by an act of Congress. It is under the USDA Agricultural Marketing Service to help farmers to sell their products at a premium. This has nothing to do with food security or food safety or nutrition that’s even listed in the National Organic Program website. Do we want candidates to support only farmers who want to sell high end food to consumers? This group is not about making food affordable for the local people. It’s about growing their industry plain and simple. They use no evidence or science to dictate what has been shown to be truly sustaining. Organic farming is not the only answer to food sustainability and nor is it about food security or affordability. 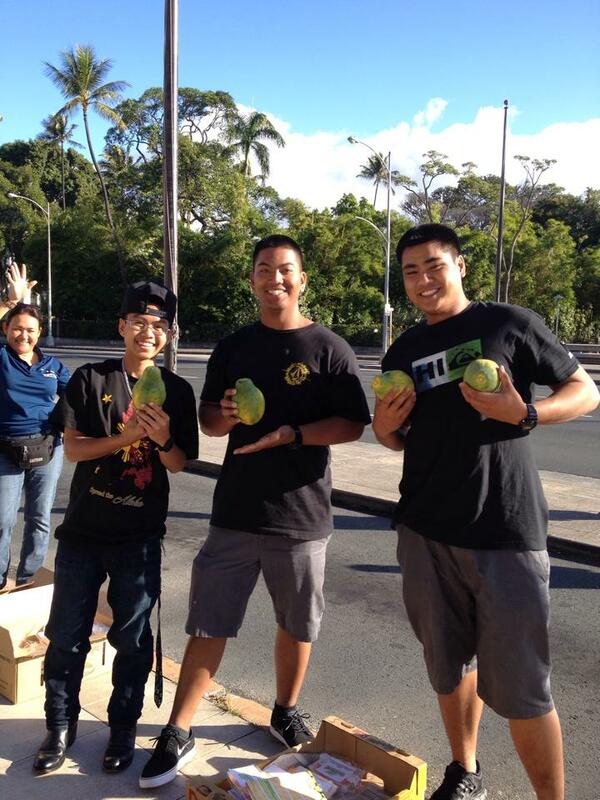 We need all the tools in agriculture to get Hawaii more food secure and not just funding premium products! We’ve got to maximize the yields we get in our currently lands first and foremost to have the least environmental impact overall. 3) Do you support funding state programs that expand support programs (including loans, business planning, safety certification, , education, grants in aid) for farmers growing food crops? I have no problem with this question being asked and yes, we should look at supporting ALL farmers who grow things, not just food crops! 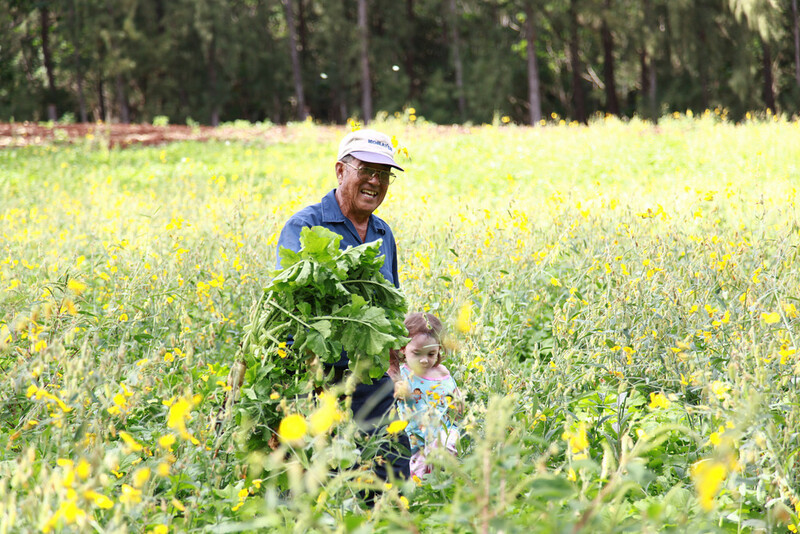 Agriculture in Hawaii is so much more than food. Anyone who grows something here that is their livelihood should have our support, whether it be flowers, coffee, vegetables, cocoa, etc. We’ve got to value ALL farmers and stop dividing up ag into what is and what isn’t considered agriculture. The growing of things are only done by very few people and we should value and give them our support. 4) Do you support legislation that would preserved and support our native species, including pollinators, adversely affected by pesticide use? This question posed is very biased in how they are presenting the issue. First of all, the honey bees we have in our islands are anything but native. We’ve brought them in nearly a hundred years ago. They have competed with or very own native pollinators and as a result have decimated our true native species of bees. Typical anti-GMO literature will give people the impression that there’s an armageddon of bee deaths. The antis will all claim that GMOs and pesticides are killing them all. It’s odd because the latest data points in the opposite direction. The latest statistics collected by the USDA shows that honeybee colonies are definitely growing with Hawaii having some of the highest yields also. Honey yields increased by nearly 15% this year. If what they CFS is saying is true, this would not be the case given their statements. Making a law based on false evidence will only have unintended consequences that we just don’t need. 5) Do you support the labeling of foods that have been genetically engineered? 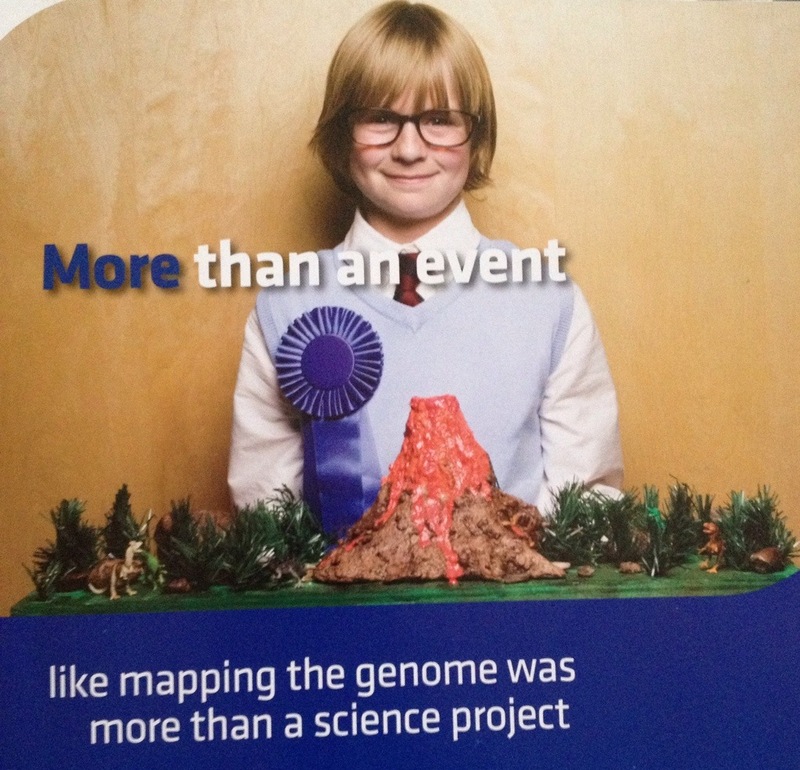 This is typical of the CFS to be touting this. The truth is the labeling issue is not about the right to know as they claim. It’s about a means to a ban. The simple idea of this label goes far beyond just putting a sticker on a package or a fruit. It will include testing, segregation, and enforcement to create such a standard. Do you think that Hawaii as a state can afford to handle such an issue? The DOH has repeatedly stated that attempting to label some 20,000 products and making sure it is in compliance with such a law is going to cost each and every consumer. Who does that hurt? The ones with the least who can barely afford to make it now. 6) If elected, will you vote to protect home rule of counties over agriculture? First of all, historically speaking, Hawaii was not unified and at a warring state for hundreds of years. It wasn’t until a leader with a keen eye for leadership realized that they islands had to be unified. That person was King Kamehameha who saw to it that the entire island chain became united. Currently, we have politicians like Gary Hooser, Tim Bynum, Margaret Wille, Brenda Ford, Jessica Wooley, and Kaniela Ing who are supporting the home rule clause. They want to undo the unity in Hawaii agriculture and have fabricated a war which only takes away from the big goal of food security and affordability. Mr. Bynum is also finding out that passing such home rule laws come with a cost that he had ignored. Guess who will have to pay for those costs? Yes, all of the residents in those counties in the form of higher property taxes and fees to cover the implementation of such laws. 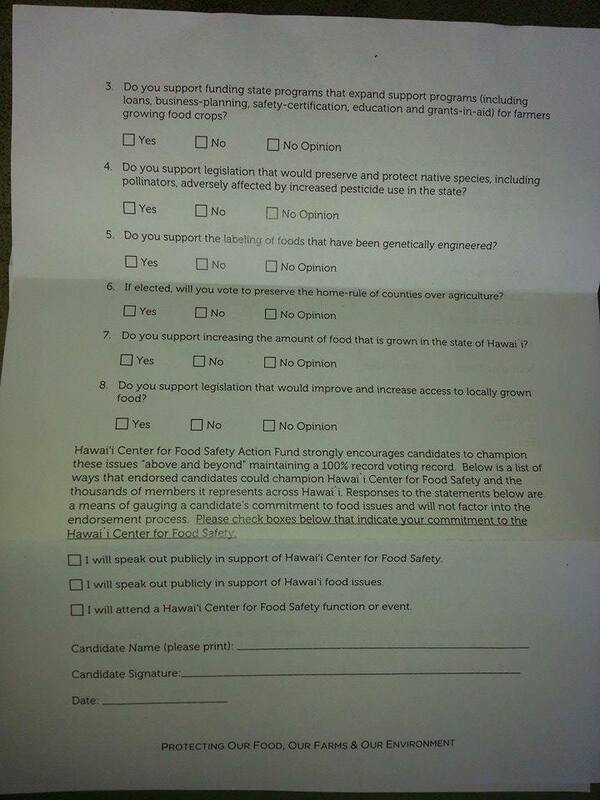 7) Do you support the growing of more food in Hawaii? Um, yes, we all support he growing of more food. Attacking farmers and the technology they use isn’t going to help achieve this goal. CFS is clearly anti-biotech and anti-aquaculture which is some key components to our locally grown foods here. Will that mean they will block new technology if it saves bananas from viral diseases that are hitting farmers now? Does this group wish to be a part of solving the problem or are they contributors to the problem? I see them as the latter when it comes time for more locally grown food. 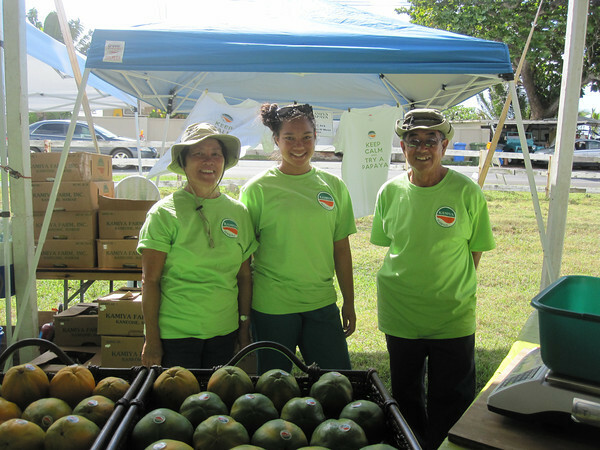 Are they going to help fund research to help solve Hawaii’s food problems or only be takers? Their history of lawsuits against farmers only tell me that they are going to impede options to farmers and ranchers. That’s not what we need in Hawaii at all. 8) Do you support the legislation to access more locally grown food? This question sends shivers down my spine. How is more legislation upon farmers going to increase locally grown food? More laws mean more burdens and loops that farmers must go through to do their work? What we actually needs is less legislation to achieve more locally grown food. Real farmers already have to contend with the burdensome Food Safety and Modernization Act that costs thousands to implement, as well as labor laws, tax laws, and so many other laws that apply to their businesses. Leaders need to incentivize farming not punish them, which is what we have done in the last several years. Want more food here? Support those farmers and work collaboratively to reach that goal. I wrote an earlier post about why people, especially leaders, need to be very wary about this group. This group is about taking away possible solutions and use the heavy handed fear tactics that have divided the Kauai community. 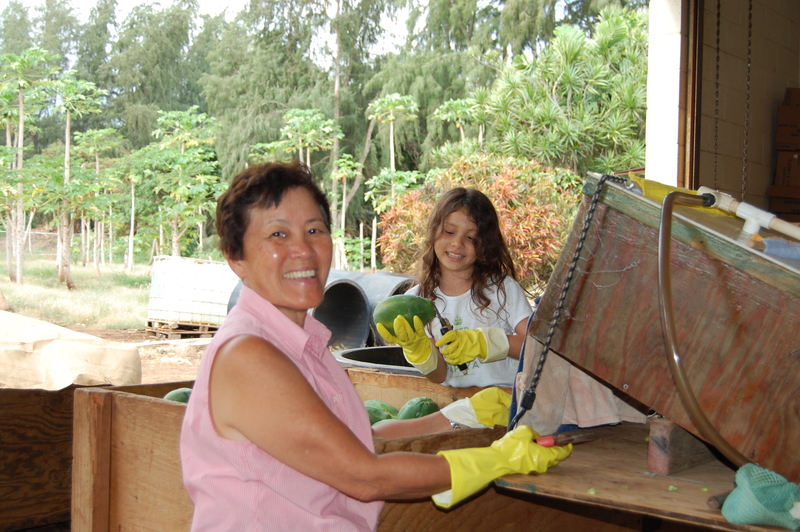 We don’t need more emotion, ideology based demands in Hawaii’s food security and sustainability issues. We need to use data and evidence to guide the state towards the goal. The Center for Food Safety isn’t about collaborating and HELPING Hawaii people achieve the goal but about blocking possible options. From the Center for Food Safety website. Clearly fear peddlers and not supporters of farmers at all. If you as leaders and candidates choose to align with this group, you’ve just taken us 20 step backwards instead of forward. This group isn’t from here and doesn’t have any connection to the local roots we all share in agriculture. We need collaborators in these issues, not takers and fear mongers. Why do we want to move Hawaii into the dark ages? Open up people’s minds to what’s happening in the world instead of shutting it down in fear and ideology. That’s the true responsibility of a good leader! If you choose to align with people who believe that they must wear gas masks and hazmat suits on farms, then that tells me that I won’t be endorsing you as a candidate. 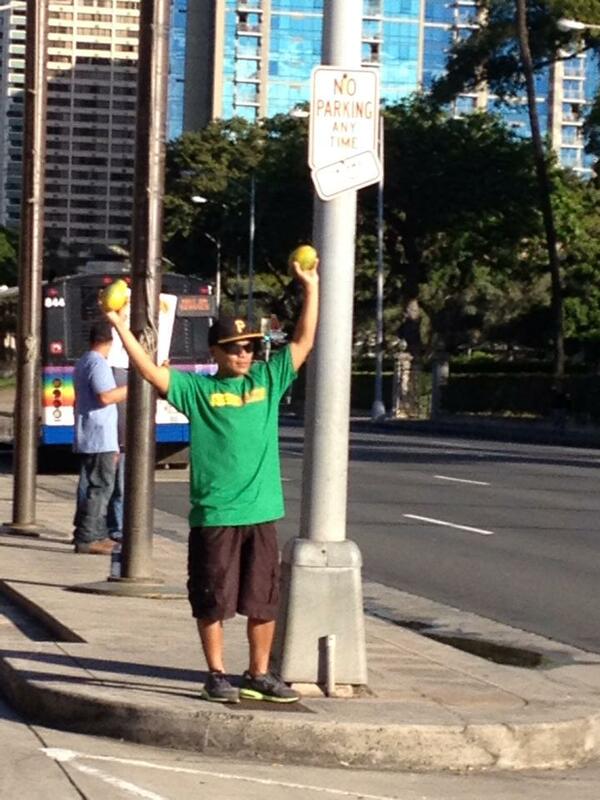 We don’t need fear peddlers in Hawaii. We need people who do their due diligence and research the issues and not stand on ignorance and ideology.